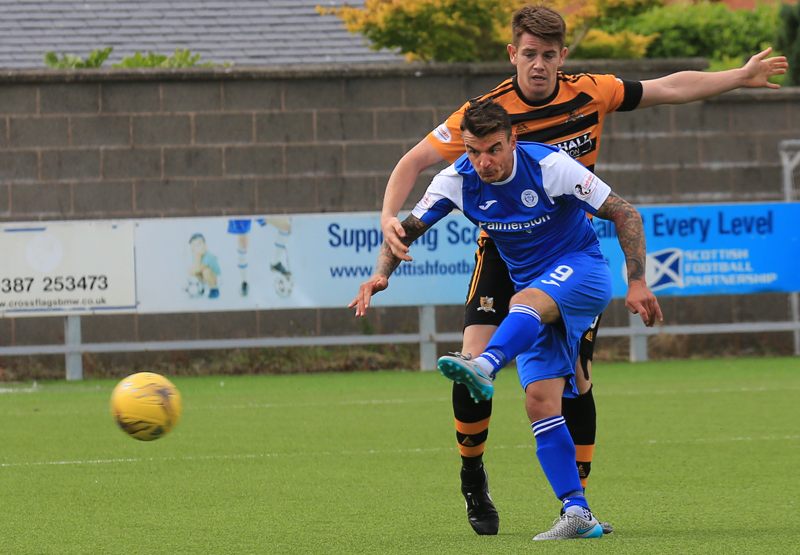 Queens made the perfect start to their league campaign this afternoon as they claimed a 3-1 victory against visitors Alloa in their opening home game of the 2015-16 Championship season. It took the hosts just 5 minutes to go ahead when striker Derek Lyle continued his fine goalscoring run, and when a double from Iain Russell had Queens 3 goals to the good at the break, the win looked very likely, and although the visitors got themselves back into the contest early in the second period, they were not able to add to their tally as once again Queens came up with an opening day victory. Following last week`s cup victory at Annan, Queens made two changes to the team that started at Galabank. Mark Millar`s suspension, and Dale Hilson`s injury, saw Scott Hooper, and Jake Pickard come into the starting X1, with youngster Pickard making his first start. There were also first competitive appearances in the squad for new signings, Callum Tapping, Darren Brownlie, and Shaun Rutherford. Queens lined up in a 3-4-1-2 formation with Ryan Conroy playing in behind twin strikers Derek Lyle, and Iain Russell. There were still a few fans entering the ground when the home side took the lead with barely 5 minutes on the watch. There seemed to be little danger for the visiting defence following Scott Hooper`s long clearance, but as the ball bounced between Lyle and Alloa captain Hill, it was Derek Lyle who reacted quicker to turn and drive the ball past `keeper Crawford`s near post from close range. There were stifled appeals from the Alloa defence for a foul on their captain, but it was never going to sway referee, Anderson to change his mind. It was the striker`s 6th goal in his last 5 competitive games, and his ability to keep on finding the net with such regularity is a major plus for Queens. The visitors responded to going behind by winning their first corner of the game almost immediately, and although the initial delivery was repelled, a second ball into the Queens penalty area saw a decent header from Reintam flash just past the far post. Having fallen behind, the visitors started to be more open about their play, and the lively and impressive midfield duo of Flannigan, and McManus began to have plenty of influence on the game, and it was a perfectly flighted free-kick into the box by Flannigan that led to Robbie Thomson having to make his first real contribution to the game, claiming the ball confidently amongst a clutch of players. 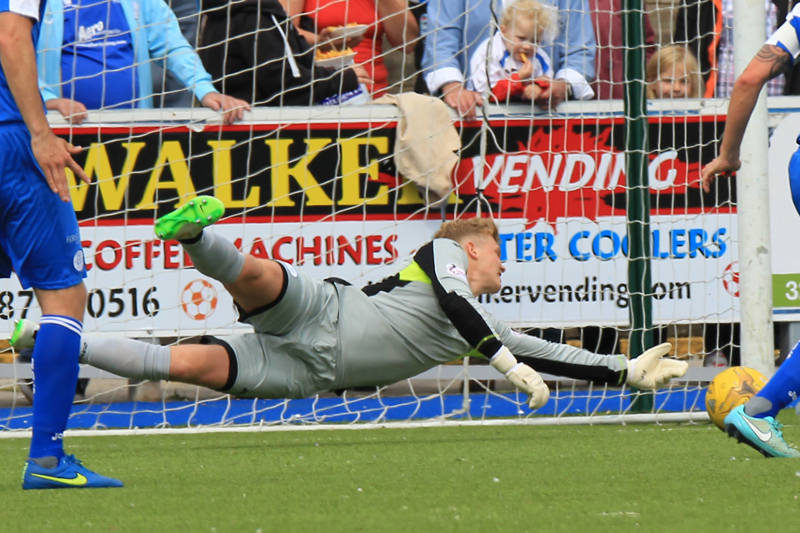 Minutes later the Queens `keeper was called upon again as this time he pulled off a superb diving save to keep out a header from McAusland that seemed to be creeping into the far corner, as the visitors stepped up their search for an equaliser. The away side went closer still to gaining parity when Flannigan`s drive from distance only just missed the target as Queens continued to be pressed back. The home side`s next half chance came courtesy of the Alloa `keeper. As Iain Russell chased a long ball into the penalty area, `keeper Crawford slipped as he prepared to clear the ball to safety, but fortunately for him he was just able to kick the ball away from the Queens striker who would have certainly benefitted from the slip. With what was perhaps just their second good opportunity of the half, Queens doubled their advantage on 29 minutes, and once again, the Alloa defence caused their own problems. Jordan Marshall`s ball picked out the run of Iain Russell down the left and after judging the bounce of the ball better than his opponent,and with the angle narrowing all the time, the striker raced into the box before smashing a low drive past the helpless Crawford. 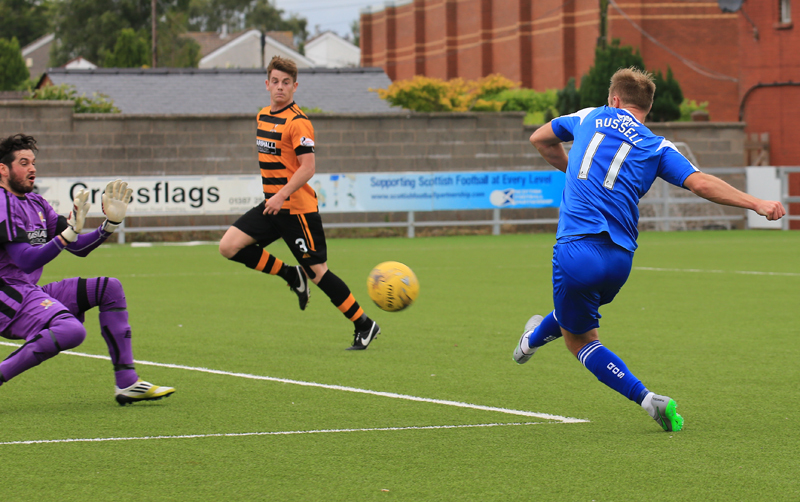 The goal was Russell`s first since he netted in the 4-1 home win against Cowdenbeath back in March, and 9 minutes later he scored his second and Queens` third of the game. The attack came down the left again and once more it was Jordan Marshall`s ball that found the striker, and with his back to goal and being surrounded by two defenders, Iain Russell showed tremendous skill and control before slamming the ball beyond the reach of Crawford. Three chances and three goals for Queens, as many, if not more chances for Alloa and nothing to show for it for the visitors who I would imagine could not have believed that they were three goals behind at the break. The away side introduced experienced striker Michael Chopra at the interval, but there was a somewhat controversial start to the second period when many in the crowd of 1726 were convinced that the home side should have been awarded a penalty. After a free-kick was floated in from the right the Alloa defence struggled to clear the ball and as both Russell and Lyle tried to force the ball over the line, the ball appeared to be pushed away by a defender on the line. In fairness to the officials it all happened so quickly and was on their `blindside` but from the stand it did seem like a clear handball. If there was to be a way back into the game for Alloa, it would mean them scoring early in the half, and 4 minutes in they got themselves a lifeline. Sloppy defending from Queens led to a poor pass out from skipper Chris Higgins, and after seizing on the loose ball Flannigan drove forward unchallenged and placed a shot past the diving Thomson. The home side responded straight away and as the game became more stretched, Queens created several chances to extend their lead. Lewis Kidd was first to try his luck and after excahanging passes with Ryan Conroy his shot from the edge of the box was well off target. In their next attack Queens almost benefiitted once more from a mistake by Alloa `keeper Crawford. Russell chased a long ball from the back and put the `keeper under pressure, and although his clearance fell straight at the feet of Lyle, the `keeper was relieved to see the striker`s attempt from 35 yards out go wide of the open goal. With Queens now looking like scoring each time they ventured forward, Russell was not too far away from claiming the match ball after a shot by Lyle fell nicely into his path, but he snatched at the opportunity and the chance had gone. Youngsters Marshall, Hooper, and Pickard were all sticking well to their alloted tasks, and Pickard - on his full debut - had a steady game in the centre of the park. With 15 minutes to go, Kyle Jacobs won possession midway inside the Alloa half, and after moving forward his left foot shot from 20 yards out didn`t miss the target by very much. The introduction of Chopra had given the visitors a bit more guile in attack, but there was no guile attached to the smash to the head he dished out to Jordan Marshall, a decision that saw him become the second player to be booked in the game. Lewis Kidd was replaced by Callum Tapping with 7 minutes left of play as the new signing made his first competitive appearance for Queens. A flowing move - by far the best of the game from Queens - should have brought them a fourth goal. Ryan Conroy`s cheeky pass through the legs of a defender sent Russell racing clear down the left and his cut back picked out Derek Lyle almost on the six-yard line, the striker`s effort flew straight at the `keeper and rebounded straight back at Lyle and then up and over the bar. With Queens still pressing forward and Russell continuing to search for his hat-trick, the striker went close on two occasions as the game moved towards it`s conclusion. Firstly a solo run saw him weave his way into the box, but with Conroy better placed to receive a pass, Russell drove his shot straight into two defenders instead, and then with what was almost his last kick of the game he sliced a shot into the side netting after Lyle set him up following a superb long ball from the impressive Marshall. The last actions of the game saw Aidan Smith and Darren Brownlie replace Derek Lyle, and Ryan Conroy, but neither touched the ball as the final whistle sounded on an opening day victory for Queens. Two-goal Iain Russell was named as man-of-the-match, although once again, Jordan Marshall had a decent game. Early days yet, but 3 wins from 3 games is all you can ask for, and with the team still learning how to play together it`s been a very encouraging start. 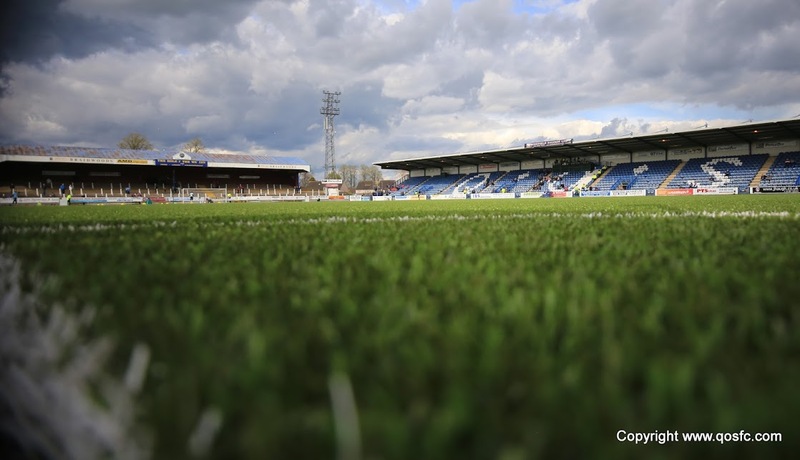 14:09 Welcome to Palmerston Park for Queen of the South`s first league game of the season against Alloa Athletic. Team line-ups to follow. 14:17 Two changes for the Doonhamers today. Hooper and Pickard in for Millar and Hilson. 14:19 Alloa Team; Crawford, Williams, Reintam, Hill, Hamilton, McManus, O`Brien, Flannigan, McAusland, Duffy, Mitchell. 14:26 Referee for today`s game is Euan Anderson and his Assistant Referees are Gary Hilland and Alan Hogg. 11 min Derek Lyle opens the scoring for Queens after a poor clearance from Hill lands to Lyle and he grabs his fourth goal of the season! 13 min Derek Lyle opens the scoring for Queens after a poor clearance from Hill lands to Lyle and he grabs his fourth goal of the season! 14 min Derek Lyle opens the scoring for Queens after a poor clearance from Hill lands to Lyle and he grabs his fourth goal of the season! 16 min Alloa nearly equalise but McAusland`s header is superbly saved by Thomson. 17 min Derek Lyle opened the scoring for Queens after a poor clearance from Hill lands to Lyle and he grabs his fourth goal of the season! 19 min Alloa on the attack again but Flannigan can`t get his shot on target. Still 1-0 Queens. 36 min Alloa come close to scoring but Mitchell misses his header from four yards out! 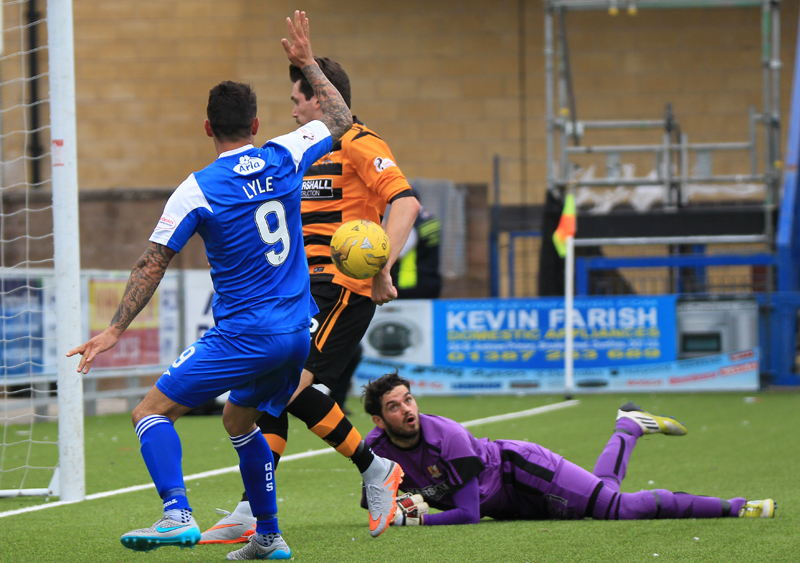 Half Time A brace from Iain Russell and Derek Lyle`s fourth goal of the season gives Queens a three goal lead over Alloa at the break. Half Time Todays Attendance is 1726. Thank you for your continued support. 49 min Alloa pull a goal back through Iain Flannigan. 56 min Crawfords poor clearance lands to Derek Lyle but his long range effort is high over the bar. 57 min Queens are starting to up the tempo here. 70 min Russell`s cross finds Lyle but his shot is saved by Crawford. 77 min Queens miss another chance to go further ahead as Russell`s strike hits the side netting. 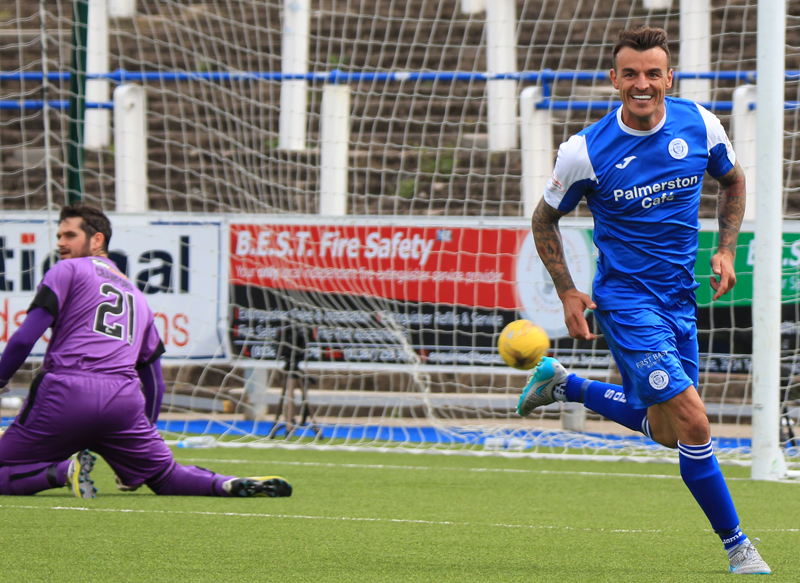 90+4 min Queens get the campaign off to a winning start after defeating Alloa 3-1 at Palmerston.